New rules mean that SRA, CLC and CILEx regulated law firms must now publish prices on their websites for certain public-facing services. Whether your regulator is the Council for Licensed Conveyancers (CLC), the Solicitors Regulation Authority (SRA) or the Chartered Institute of Legal Executives (CILEx) you must now publish price information for certain public-facing services. If you are regulated by the Bar Standards Board (BSB), then new Transparency Rules might affect you from May 2019 too. The rule changes the regulators are making are a direct result of the recommendations set out in the Competition and Markets Authority’s (CMA) Legal Services Market Study regarding price and service transparency. Depending on your regulator, we have provided information on how QuoteXpress can help your law firm meet the new regulations. 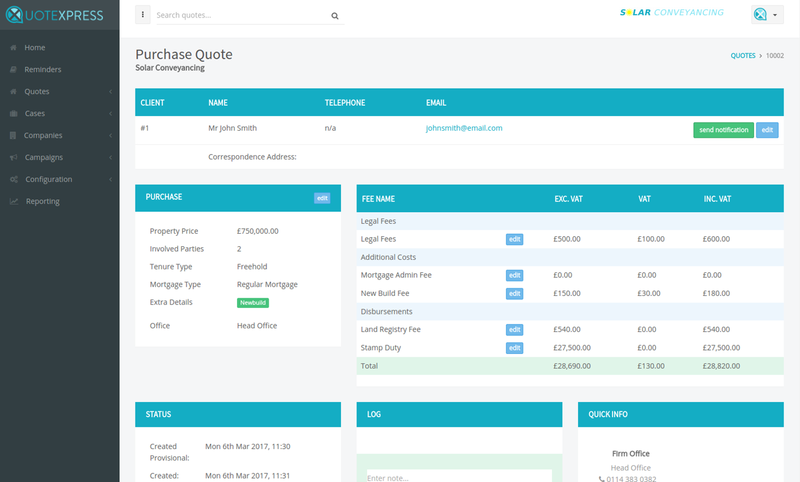 Use our website quotation calculator to publicise your prices through your website and provide clear upfront quotations to your customers. Use our Transparency Compliance Tool to comply with the transparency regulations easily. Use our pre-prepared content, derived from regulator-provided templates, to quickly publish pricing and service information to your website. Regulators have provided compliance templates for firms in order to help them comply with the new regulations. If you are regulated by the Solicitors Regulation Authority (SRA) then we can help your firm to publish its prices before the December deadline. Announced as part of its wider Looking to the Future reforms, the SRA’s Better Information, more choice reforms are designed to improve public access to legal services by making information on price, protections and services more easily available. The new SRA Transparency Rules which form part of the Better Information, more choice: Post consultation rules have been approved by the SRA board and were approved by the Legal Services Board (LSB) on 3/8/18 will come into force in December 2018. We have produced an overview of how the Looking to the Future and Better Information, more choice reforms will affect your SRA regulated firm when the SRA Transparency Rules come into force. Read our guide to the SRA Transparency Rules. If you are regulated by the Council for Licensed Conveyancers (CLC) then we can help your firm to publish its prices before the December deadline. In October 2017 the CLC published their Helping consumers choose their lawyer - service, quality and price transparency consultation, which resulted in the publication of a further consultation Helping consumers choose their lawyer - Implementation of CMA transparency recommendations set out in its legal service market study. We have produced an overview of how the changes proposed in the Implementation of CMA transparency recommendations set out in its Legal Services Market Study consultation will affect your CLC regulated firm. The changes to the CLC's regualtory requirements were approved by the Legal Services Board (LSB) on 30/8/18 will come into force in December 2018. Read our guide to the CLC Price & Service Transparency Rule Changes Consultation. If you are regulated by the Chartered Institute of Legal Executives (CILEx) then we can help your firm to publish its prices. Read the CILEx guide to the new rules. If you are regulated by the Bar Standards Board (BSB) then we can help your firm to meet the new regulations before the May deadline. Read our guide to how BSB Transparency Rules might affect Barristers from May 2019.